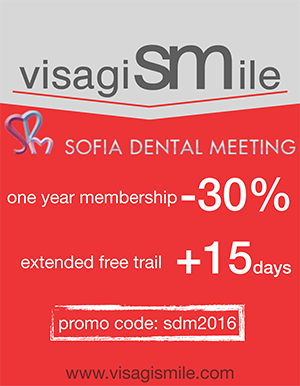 VisagiSMile will be presented on one of the biggest international dental congresses in Europe – the 9th Sofia Dental Meeting which will take place on 6-9 October 2016 in Sofia, Bulgaria. There will be more than 1500 participant from all over the world, 90 international speakers in 4 full days filled with lectures, hands on courses, live demonstration and a great social program. -30% discount for VisagiSMile membertship (the regular price 199.00 Euro). To get the discount, enter the promo code: sdm2016 when purchasing your membership or use this direct link. Extended trial period for all new users who visit the VisagiSMile stall at SDM 2016. In our workshop “VisagiSMile – New Concept of Digital Smile Design”, Dr. Georgi Iliev will reveal and demonstrate the principles of creating a Personalized smile design, Facial recognition – LIVE demonstration, Dental photography techniques, VisagiSMile in Clinical practice, on 8 October 2016. The workshop will also present the updated version of the software. Save the date! For more information, please refer to the congress program. Visit our VisagiSMile stall to get help with registering and working with the software. We are ready to answer all your questions. All SDM participants who visit our stall will be able to claim a free extended trial period for the software and a -30% discount of the software fee for one year – only during the congress days.